OBJECTIVES: A skeletal anterior open-bite is a challenging malocclusion for the orthodontist due to the difficulty and instability of correction. Treatment options for the adult patient include extractions, anterior extrusion with intermaxillary elastics, posterior intrusion using skeletal anchorage, occlusal adjustment, and orthognathic surgery. Patient compliance plays a key role in posttreatment stability. 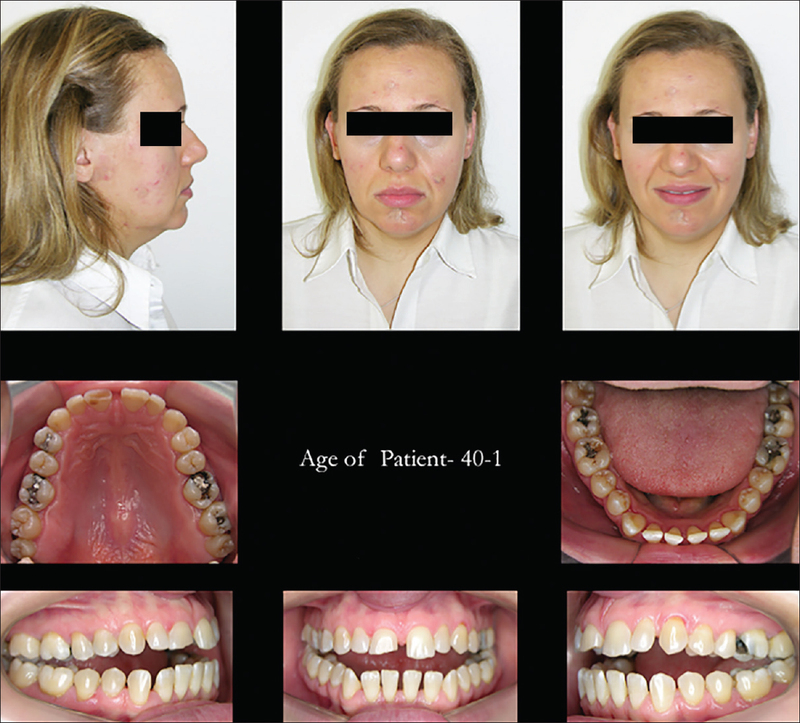 The present case report demonstrates the orthodontic treatment of an adult patient who presented with a complex open-bite malocclusion. MATERIALS AND METHODS: Treatment involved the placement of four miniscrews to assist intrusion of maxillary molars by applying posterior vertical maxillary elastics and extrusion of the anterior segments using anterior vertical interarch elastics. RESULTS: Ideal intercuspation was successfully achieved and good stability was maintained during 3 years following treatment. CONCLUSION: The intrusion of the maxillary molars with miniscrews is an interesting option in selected cases of skeletal anterior open bite. The retention protocol should be specific in these cases. 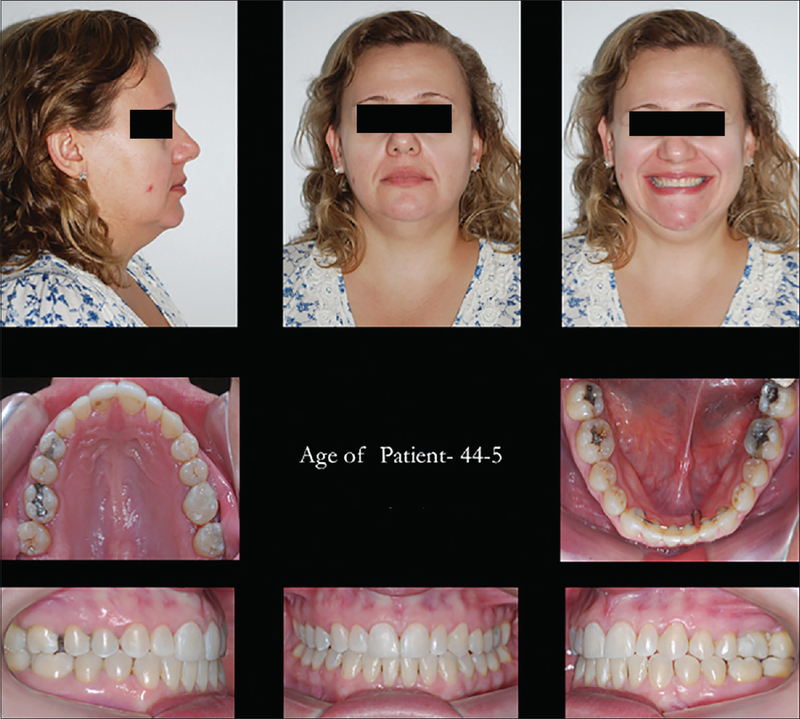 The aim of the present case report is to describe the nonsurgical orthodontic treatment of an adult patient who presented with a complex anterior open-bite malocclusion which was treated using a combination of skeletal anchorage, fixed appliances, and vertical intermaxillary elastics. The correction of the open-bite, achieved mostly by the intrusion of posterior teeth, was satisfactory and stable 3 years after the end of active treatment. A healthy 40-year-old Caucasian woman presented concerned about her compromised speech and masticatory efficiency as a result of a long-standing open-bite. The patient reported that she could not incise food with her anterior teeth and had difficulty in chewing. A facial analysis showed a symmetrical face, a straight profile, and lip competence. A smile analysis showed a decreased maxillary incisor display. The dental midlines were coincident with the midsagittal plane. Intraorally, she had a half-unit Class II molar relationship on the right side and a Class I relationship on the left side, with generalized maxillary and mandibular spacing. An anterior open-bite extended from first molar to first molar [Figure 1] and [Figure 2]. Only the second and third molars were in occlusal contact [Figure 2] and [Figure 3]. The overjet was 2.1 mm and the overbite was -4.1 mm. A functional evaluation revealed an adaptive static and dynamic forward tongue posture, which was evident during speech and swallowing. The patient's speech was distorted during the pronunciation of the sibilant sounds [s] and [z]. In addition, the tongue presented an increased size which approached macroglossia. A panoramic radiograph showed no maxillomandibular abnormalities. Cephalometrically, there were good basal sagittal and vertical relationships and a balanced soft-tissue profile. The palatal plane was rotated counterclockwise [SN.PP = 0.5°]. The maxillary and mandibular incisors were proclined and protruded [Table 1]. General dental treatment was required and completed prior to the commencement of orthodontic treatment. The volunteer signed a release form authorizing the use of his image in scientific research. The main objective of orthodontic treatment was to eliminate the open-bite while achieving satisfactory smile aesthetics and masticatory function. To provide stability of the treatment results, the elimination of the abnormal tongue function was proposed during the active phase of treatment. Maintenance of the original facial aesthetics was planned because it was considered satisfactory and pleasant. The first proposed treatment alternative was a combined orthodontic-surgical plan. The open-bite would be corrected by posterior maxillary impaction and the consequent mandibular auto-rotation would close the open bite. A second treatment option was the extraction of the first molars or premolars followed by anterior retraction and mesialization of the posterior teeth during space closure. This would assist open-bite correction by to the uprighting and extrusion of the incisors and the counterclockwise rotation of the mandible. Extrusion of the anterior and posterior teeth with intermaxillary elastics was considered as a third option to manage the open bite. 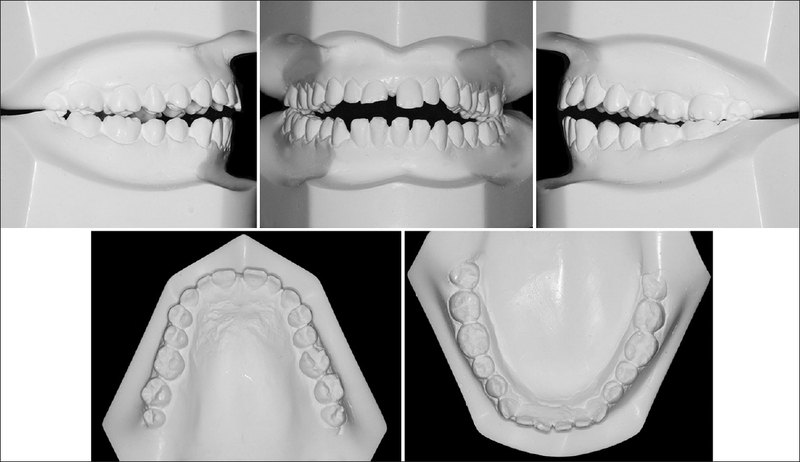 This alternative was likely to have limited or no skeletal effect and would require a large amount of dental extrusion and patient compliance. A fourth alternative involved the extraction of the third molars, the intrusion of the maxillary molars using skeletal anchorage, and the simultaneous extrusion of the anterior teeth with vertical intermaxillary elastics.,,, This option had the potential to provide some minimal positive facial changes at the same time that the open-bite was being corrected. The patient did not accept surgery because of the impact it would have on her facial appearance. The second option was discarded because of the risk of exacerbating the patient's lip retrusion during the retraction of the anterior teeth. The third option was also eliminated because extensive extrusion of the anterior teeth would have a high susceptibility to relapse and could also produce excessive gingival display. Although, the fourth option presented the most challenging biomechanics, it was considered that it would provide the best skeletal and dental results. The crown fracture of the maxillary right central incisor was restored and all third molars were extracted before starting the orthodontic treatment. The fixed appliances consisted of preadjusted brackets following a Roth 0.022-inch prescription [Miniature Twin Metal Brackets, 3M Unitek, Monrovia, Calif, USA], augmented with welded buttons on the lingual aspects of the maxillary molar bands. A sequence of 0.014, 0.016 and 0.018-inch nickel-titanium arch wires were engaged for initial levelling and alignment following which, a 0.018-inch stainless steel maxillary arch wire was used to start posterior intrusion mechanics via miniscrews. Then the intrusion was continued with the stainless-steel 0.020-inch and 0.019 × 0.025-inch arch wires [3M Unitek, Monrovia, Calif, USA]. Four 9 mm × 1.6 mm miniscrews [Neodent, Curitiba, Brazil], two buccal and two palatal, were inserted between the first and second maxillary molars. Short elastic chain [3M Unitek, Monrovia, Calif, USA] was used to apply the intrusion [Figure 4] during the middle of which, the left buccal miniscrew needed to be repositioned more apically, because it approached the molars. The total intrusion force used was 250 g per side (right or left). After 12 months of treatment and 8 months of molar intrusion, the maxillary and mandibular interdental spaces were closed by elastic chains acting from second molar to second molar. Elastic chains were initially used with rectangular and finally with 0.020-inch stainless-steel arch wire. [Figure 5]a shows the elastic chain in the mandibular arch, and the anterior teeth tied-together in the maxillary arch to avoid reopening of the spaces. The elastic chains were maintained throughout treatment, particularly in the mandibular arch to avoid reopening of the spaces due to the anterior tongue posture and function. 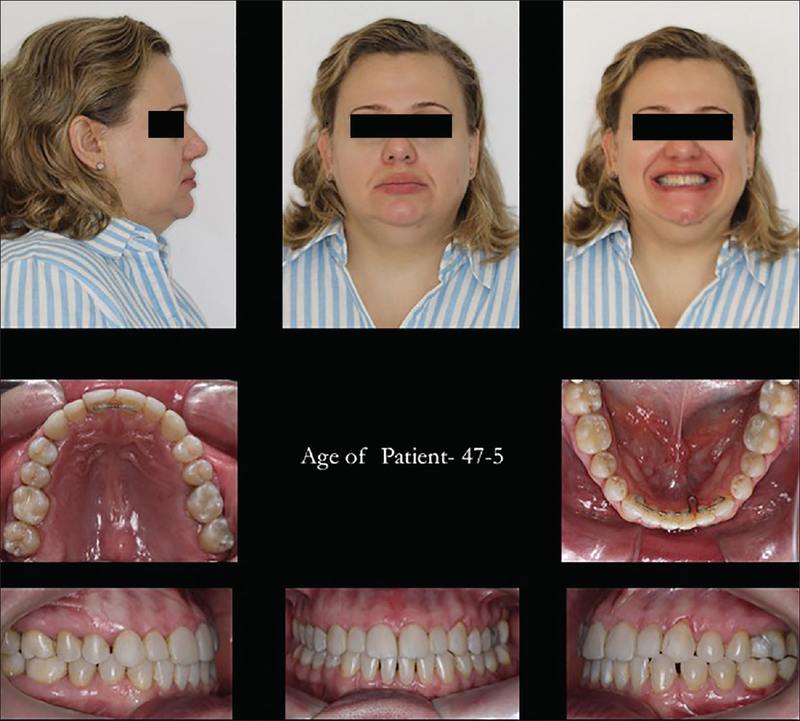 After 20 months of treatment, considerable reduction of the open-bite had occurred [Figure 5]a. 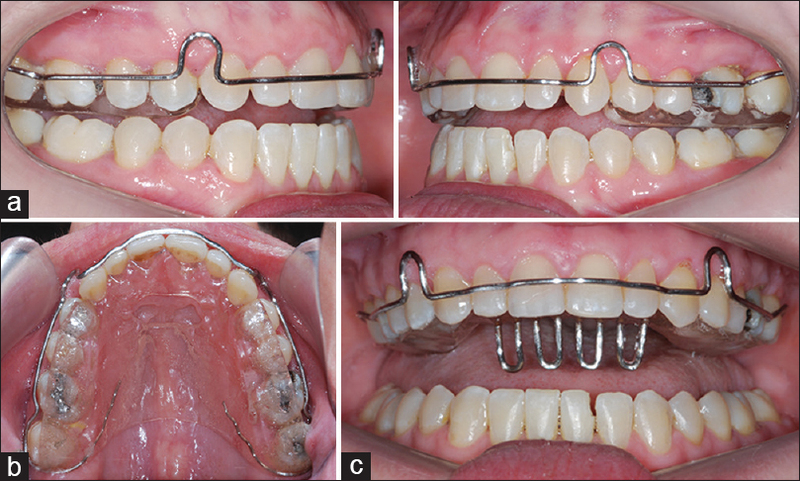 At this time, 0.018-inch stainless steel arch wires were inserted in the maxillary and mandibular arches, and bilateral vertical interarch elastics were added to aid in the closure of the remaining open-bite [Figure 5]b. 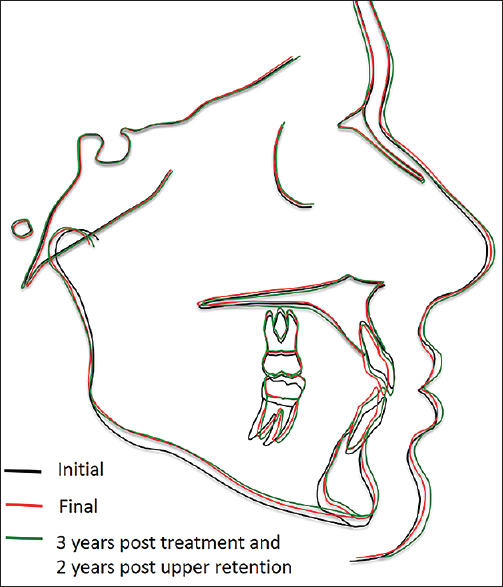 The vertical elastics were used 20 h/day for 12 months and the results can be observed in [Figure 5]b (open-bite closure). After this period, the intermaxillary elastics were maintained only overnight for 10 months, as an active retention period. The fixed appliances were removed after 4.1 years of active treatment. Wrap-around retainers were provided for the maxillary arch and a 0.028-inch stainless-steel arch wire segment was bonded to the mandibular anterior teeth. Two maxillary appliances with posterior bite blocks to retain the posterior intrusion were constructed for day and night-time use [Figure 6]a. The daytime retainer incorporated an orifice close to the incisive papillae which guided correct tongue position [Figure 6]b. The night-time retainer contained a palatal crib to prevent lingual pressure on the anterior teeth [Figure 6]c. A loop was made in the mandibular retention wire to allow subsequent restoration of the left central incisor [Figure 7]. The maxillary anterior teeth had aesthetic restorations placed after orthodontic treatment was completed. The patient was also referred for a maxillary labial frenectomy to prevent reopening of the diastema between the maxillary central incisors. A myofunctional evaluation was also undertaken to investigate and correct, if necessary, the resting tongue posture and function, to minimize the risks of open bite and anterior diastema relapse. A harmonious facial balance, improved smile, and good interdigitation were achieved at the end of treatment. The intraoral photographs and cephalometric analysis showed that there was a 5.8 mm improvement in the overbite, from -4.1 mm to 1.7 mm [Figure 7], [Figure 8], [Figure 9] and [Table 1]. There was improvement in the apical base relationship [ANB angle] from 2.7o to 0.7o, and an increase in mandibular protrusion [SNB angle] from 81.7o to 83.4o, as a result of the counterclockwise rotation. The maxillary molars were intruded by 1.9 mm and the maxillary incisors were extruded by 1.6 mm. The lower incisors remained stable. There was no obvious evidence of clinically-significant root resorption. The patient was satisfied with the treatment results, and the outcome was stable 3 years after the end of active treatment [Figure 10] and [Figure 11]. No return of the anterior open-bite relapse was observed. The dentoskeletal changes that occurred during treatment and after 3 years posttreatment are presented in the cephalometric superimposition [Figure 12]. The maxillary removable retention was discontinued after a year but the mandibular retention was recommended for a lifetime. During the retention period, there was a tendency for the interproximal space of the maxillary central incisors to reopen. Therefore, a 0.020-inch stainless steel wire was bonded to the palatal surfaces of these teeth [Figure 10]. There was space opening distal to the left canine in the mandibular arch. These changes may be explained by the patient's refusal of the upper labial frenectomy and the recommended myofunctional therapy after treatment. Some anterior tongue pressure likely remained which may have tipped the incisors forward and as evident by the increase in incisor mandibular plane angle (IMPA). After treatment, the patient reported an improvement in function, especially in incising food. Clear improvement during speech pronunciation was also apparent. However, this was not confirmed by a speech therapist because the patient refused. In the present case, the patient's chief complaint was primarily functional, related to speech and mastication. Aesthetic-related complaints were minimal, but concerned the insufficient display of the maxillary anterior teeth upon smiling. The patient's balanced facial appearance and profile played an important role in the decision for a non-surgical treatment option consisting of pre-adjusted Roth prescription fixed appliances aided by skeletal anchorage. The correction of the anterior open-bite resulted mostly from a counterclockwise rotation of the mandible (caused by the extraction of the third molars and the intrusion of the maxillary posterior teeth) plus the extrusion and uprighting of the maxillary anterior teeth (due to the use of vertical intermaxillary elastics). The amount of miniscrew molar intrusion was 1.9 mm and is similar to the average intrusion previously reported., It is expected that the anterior open-bite may close at a rate of 3–4 mm for each millimeter of molar intrusion obtained. The 5.8 mm of overbite correction obtained was within this ratio (5.8/1.9 = 3.05) and confirms previous reports. Despite the dental Class II relationship correction, there was an increase in the initial overjet. This may be explained by the presence of larger diastemas in the mandibular arch at the beginning of treatment. Consequently, the mandibular incisors experienced greater retraction and lingual inclination than the maxillary incisors resulting in an increase in overjet [Table 1]. This result is consistent with a recent study demonstrating that overjet decreases in only 65% of the cases when the mandible undergoes a counterclockwise rotation. The stability of the open-bite correction was excellent at the 3-year posttreatment review, considering that 80% of relapse occurs in the first year after treatment. Previous reports have recommended that careful attention is required during the retention phase because of the significant amount of tooth movement that can occur when miniscrews are used as part of the biomechanics. For this reason, posterior occlusal coverage was included in the wrap-around maxillary retainer to minimize extrusion of the posterior teeth., However, other appliances might also be necessary to modify tongue posture and function and to avoid an anterior resting tongue position at nighttime. Myofunctional therapy has also been advocated as an adjunct in the reduction of open-bite relapse.,, Several authors have reported that the risk of incisor protrusion is greater in cases in which there is altered tongue posture at rest, and it is smaller when there is only altered function (speech and swallowing). Therefore, speech therapy is indicated especially in cases in which altered tonguerest posture is present. The presented patient refused myofunctional and speech therapy as recommended. Fortunately, there was little impact on overbite stability as only a small diastema opened between the left mandibular canine and first premolar and between the maxillary central incisors. The upper diastema was corrected and retained with a bonded segment of coaxial wire. Another possible factor that may have caused the opening of the midline diastema was that the patient did not accept the frenectomy of the upper lip as requested at the end of orthodontic treatment. In addition, perhaps the maxillary retainer should have been used for a longer period of time. The clinical stability at 3 years posttreatment can be confirmed by the cephalometric superimposition, which shows a reduction of the skeletal vertical component due to the mandibular counterclockwise rotation, which increased the SNB angle and reduced the ANB beyond that which was achieved during orthodontic treatment [Figure 12]. It may be speculated that the vertical control promoted by the occlusal coverage of the maxillary retainers contributed to these posttreatment changes. The reduction of the maxillary and mandibular incisor proclination achieved during treatment was partially lost at 3 years posttreatment, possibly due to tongue function and that full upper and lower arch control was not established on a long-term basis. These changes in incisor inclination during the treatment and retention periods also explain the reduction and increase of lip projection during these periods. 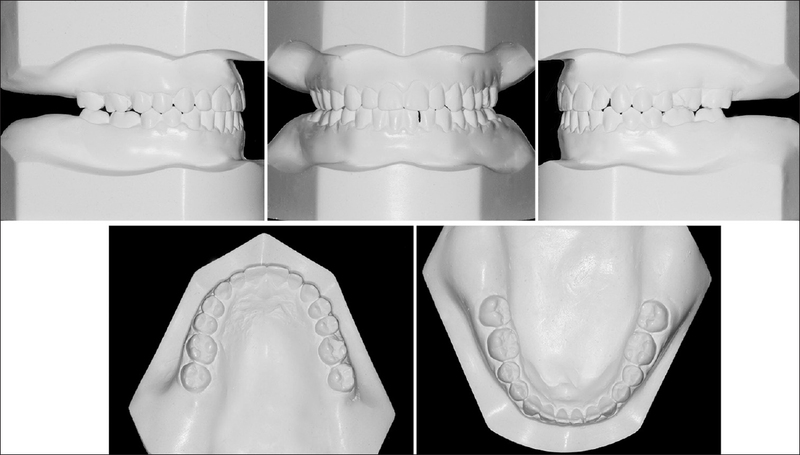 The present case report details the non-surgical orthodontic treatment of an adult patient with a complex anterior open-bite treated using a combination of skeletal anchorage for upper molar intrusion, fixed appliances, and vertical intermaxillary elastics. Molar intrusion might be effectively achieved by using miniscrews as anchorage in patients with an anterior open-bite. Therefore, this treatment modality can be considered an acceptable alternative to orthognathic surgery in selected cases in which the dental malocclusion—rather than facial aesthetics—is the primary patient concern. However, retainers to minimize extrusion of the posterior teeth should be used to improve stability. The outcome of this case was stable after 3 years, although a longer follow-up is necessary to assure long-term stability. Janson G, Valarelli FP, Beltrao RT, de Freitas MR, Henriques JF. Stability of anterior open-bite extraction and nonextraction treatment in the permanent dentition. Am J Orthod Dentofacial Orthop 2006;129:768-74. Janson G, Crepaldi MV, de Freitas KM, de Freitas MR, Janson W. Evaluation of anterior open-bite treatment with occlusal adjustment. Am J Orthod Dentofacial Orthop 2008;134:10-1. Maia FA, Janson G, Barros SE, Maia NG, Chiqueto K, Nakamura AY. Long-term stability of surgical-orthodontic open-bite correction. Am J Orthod Dentofacial Orthop 2010;138:254. Baek MS, Choi YJ, Yu HS, Lee KJ, Kwak J, Park YC. Long-term stability of anterior open-bite treatment by intrusion of maxillary posterior teeth. Am J Orthod Dentofacial Orthop 2010;138:396. Zuroff JP, Chen SH, Shapiro PA, Little RM, Joondeph DR, Huang GJ. Orthodontic treatment of anterior open-bite malocclusion: Stability 10 years postretention. Am J Orthod Dentofacial Orthop 2010;137:302. Greenlee GM, Huang GJ, Chen SS, Chen J, Koepsell T, Hujoel P. Stability of treatment for anterior open-bite malocclusion: A meta-analysis. Am J Orthod Dentofacial Orthop 2011;139:154-69. Sherwood K. Correction of skeletal open bite with implant anchored molar/bicuspid intrusion. Oral Maxillofac Surg Clin North Am 2007;19:339-50.
de Freitas MR, Beltrao RT, Janson G, Henriques JF, Cancado RH. Long-term stability of anterior open bite extraction treatment in the permanent dentition. Am J Orthod Dentofacial Orthop 2004;125:78-87. Janson G, Valarelli FP, Henriques JF, de Freitas MR, Cancado RH. Stability of anterior open bite nonextraction treatment in the permanent dentition. Am J Orthod Dentofacial Orthop 2003;124:265-76. Deguchi T, Kurosaka H, Oikawa H, Kuroda S, Takahashi I, Yamashiro T, et al. 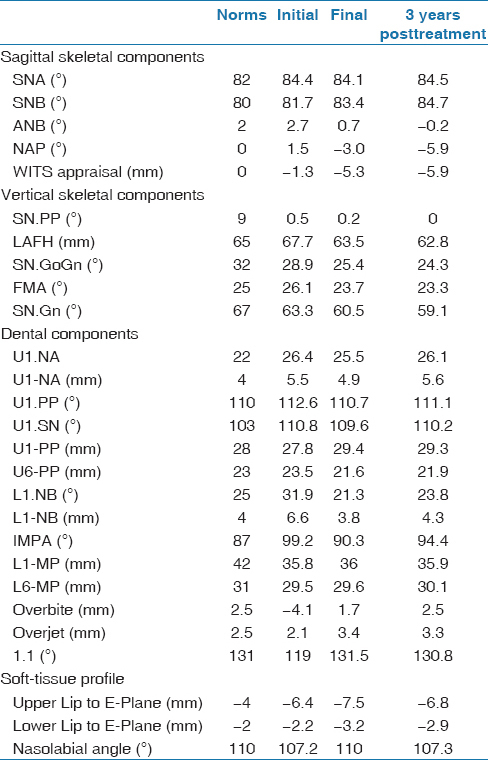 Comparison of orthodontic treatment outcomes in adults with skeletal open bite between conventional edgewise treatment and implant-anchored orthodontics. 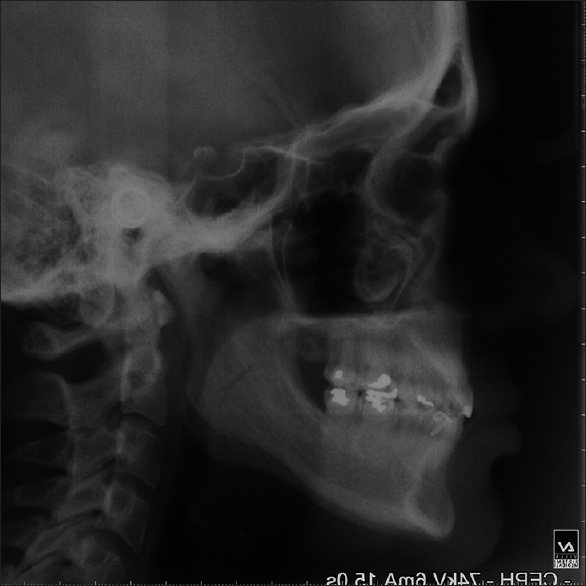 Am J Orthod Dentofacial Orthop 2011;139:S60-8. Hart TR, Cousley RR, Fishman LS, Tallents RH. Dentoskeletal changes following mini-implant molar intrusion in anterior open bite patients. Angle Orthod 2015;85:941-8. Delli K, Livas C, Sculean A, Katsaros C, Bornstein MM. Facts and myths regarding the maxillary midline frenum and its treatment: A systematic review of the literature. Quintessence Int 2013;44:177-87. Xun C, Zeng X, Wang X. Microscrew anchorage in skeletal anterior open-bite treatment. Angle Orthod 2007;77:47-56. Kuhn RJ. Control of anterior vertical dimension and proper selection of extraoral anchorage. Angle Orthod 1968;38:340-9. Huang GJ, Justus R, Kennedy DB, Kokich VG. Stability of anterior openbite treated with crib therapy. Angle Orthod 1990;60:17-24. Proffit WR, Mason RM. Myofunctional therapy for tongue-thrusting: Background and recommendations. J Am Dent Assoc 1975;90:403-11. Frankel R, Frankel C. A functional approach to treatment of skeletal open bite. Am J Orthod 1983;84:54-68. Matsumoto MA, Romano FL, Ferreira JT, Valerio RA. Open bite: Diagnosis, treatment and stability. Braz Dent J 2012;23:768-78.